Don’t let the difference between custom fitted and custom built clubs cost you your game. Custom Fitting > Don’t let the difference between custom fitted and custom built clubs cost you your game. 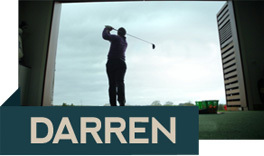 We recently got an email from Darren M and he gave the best piece of advice we could give people who book a custom fitting analysis. “ Just a quick email to say thank you. Wise words that don’t feature in another customer’s story …. Two months ago, a nice guy come see us for a full bag custom fitting analysis. He was a good solid 12 handicapper. We assessed him and recommended Mizuno Irons with Nippon 950GH Stiff shafts. He went away to think about it and managed to get Mizuno Irons with Nippon shafts elsewhere (what he thought was the same clubs for €95 less). In theory the shafts and heads were the same as we had recommended, so he bought them. Skip forward two months and we got a fairly irate phone call from the same guy, who had himself all up in a bunch because he couldn’t hit the clubs. Although we had recommended he should get the clubs built in the ForeGolf WorkShop, he had bought them elsewhere. We asked him to come back to see if we could we help him … we found that although he bought the correct club heads and shafts, they were not built and balanced to suit him. The irons were not balanced or swing-weighted correctly. They were too light in head weight which meant the swingweight was C9 and should have been D2. He felt no rhythm with the clubs and struggled to get any “hit” from them. What it means: The golfer could not feel the head and struggled to play half shots. The balance of the club is also linked to the golfers rhythm. The spin on the ball was too low as the shaft was not loading or flexing correctly as the head was light. The golfer struggled with 8, 9 and PW especially as the shaft felt too stiff or “dead “when hit with a head that was too light. The loft and lie angles had not been specified so were too weak and too flat. He was hitting them shorter in distance and missing to the right. What it means: The loft was 2 degrees too weak which meant the ball flight had too much spin from the head so it spun up towards the end of the flight leaving each iron shot short in distance and with no penetration.The lie angle was out 2 degrees and was too flat which meant the toe of the club hit the ground first at impact and made the ball fly right of target. For every degree the lie is out and away from centre the ball will miss the target by approx. 8 yards. So, don’t be confused with the terms custom fitted and custom built. It is important to remember if you are going to be custom fitted by us, you have to follow through and get the clubs hand built in our WorkShop so we can match what we have measured you for from your analysis. It’s not enough to pick a set up and assume that the measurements are right or even “standard” because a website says so or a guy behind the counter says so. The clubs have to be hand built with zero tolerances in the ForeGolf WorkShop. PS He’s had two months of awful golf and he had to pay to get the clubs taken apart and rebuilt in our WorkShop. He could have just got the clubs built by ForeGolf in the first place.